October isn’t going to stick around long either at this rate! Our house has once again turned into a factory of charts, kits, boxes, trunk shows, new releases, and finishing jobs! The dog is already nervous because she knows what those stacks of boxes means! Next Wednesday I leave on a fun journey! All the hard work of these past few months since market will be literally rolled out over the southeast portion of the country! More about that in a minute, first, a fun Halloween pic – I recruited my hubby to help me decorate for fall in early September, it was then or never and today with the rainy, dreary day, I turned the lights on my Halloween tree and I’m enjoying the atmosphere! Once Celebrations is complete, I head towards the PALS Stitching Retreat in Myrtle Beach. This won’t be a simple Point A to Point B drive. Tracy Horner from Ink Circles & I have cooked up a fun journey. What do you get when you ask an engineer to figure out the best driving route between 2 cities encompassing the most number of needlework shops?? 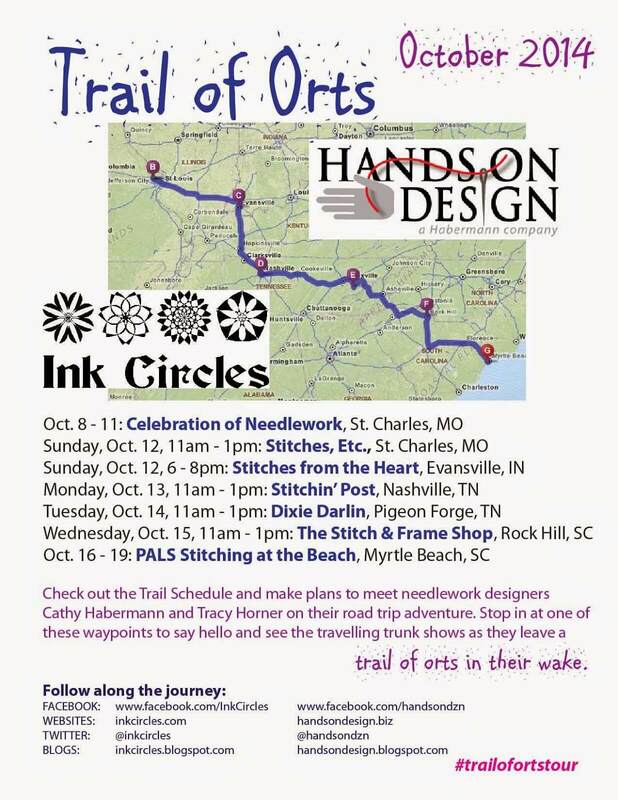 You get the Trail of Orts Tour – coming to a city (hopefully) near you! See the poster below! If you can’t make the tour – follow us on FB & Twitter with #trailofortstour. This will be my 2nd year at the PALS retreat. I’m looking forward to catching up with stitchers I met last year that I keep in touch with on FB and meeting a whole bunch of new attendees. In preparation, I was updating my Square register (the little credit card thingy) – last year when I was at PALS, I had 7 designs in my catalog. I now have over 27 (plus a whole lot more if you count the magazine designs!) The “number-crunching” part of me is really excited about that. 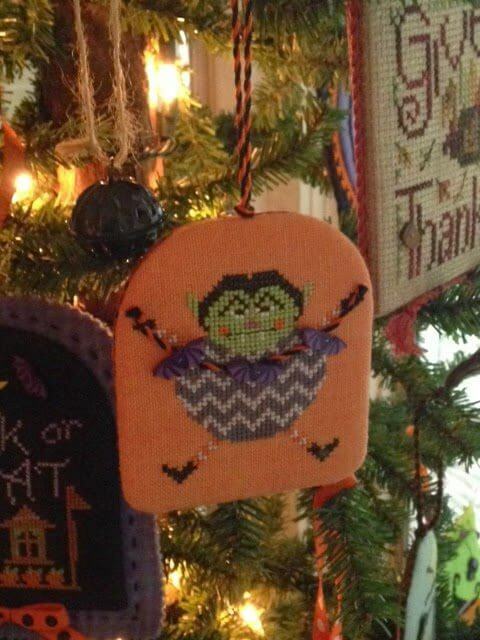 Once again, I will be bringing some extra goodies to tempt stitchers (can you say PALS Retreat design?). It will be a 2 day drive home, and a quick laundry turn-around and I’m off once again. This time I am Houston bound where I get to be an honorary buttoneer with the wonderful ladies of Just Another Button Co. at Houston Quilt Market. I went last year and it was a terrific experience from set-up to tear-down and all in between. I got so much design inspiration when I was there – that’s where I first saw that wonderful fabric I purchased for the Gather Friends Close series! Who knows what I will see this year! Gotta’ run & assemble more kits! I hope to have a Finish it Friday post this week – I’ve had several questions about the finishing of the 5-pointed star pincushion so I thought I would do a tutorial. I hope you post lots of pics 🙂 Can't wait to hear all about it! Safe travels my friend!! !